Below are quotes and reviews that have been emailed to us or posted on our Facebook page. Click here if you would like to leave a review. "K6 Construction was great to work with. Phil is professional, friendly, and he ensured our project was completed to our expectations. We will definitely use K6 Construction for any future projects. Thanks K6 Construction!" 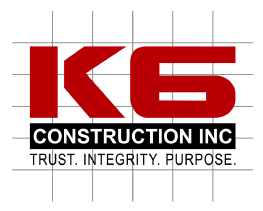 "K6 Construction is perfectly represented by their logo. Trust. Integrity. Purpose. Trust: From our very first meeting, I knew Phil would take good care of my restaurant at the Hotel Piccadilly and become my advocate when dealing with subcontractors and City officials. That trust enabled me to rest easy knowing K6 Construction was working on my behalf. Integrity: My biggest concern for construction products are the hidden costs that inevitably come up during the course of construction. No matter the issue, Phil stuck to the estimate he provided and communicated with me every step of the way if I had options which might lead to increased costs. K6 Construction handled my project with integrity and I would not hesitate to work with them on future projects. Purpose: I truly believe that Phil loves his company and his clients. He enjoys seeing his projects transform into something beautiful. It was a pleasure to work with a person that treated construction as a profession instead of just another job." "K6 Construction recently remodeled our cabin for us and did an amazing job! From the beginning, Phil and his team were great to work with. This was our first time doing a remodel, and he made the experience easy for us. We felt we could completely trust him, and that was important to us. Phil was in constant communication with us and was on the job site regularly to supervise the process even though he had to travel out of town for our particular job. He supported us every step of the way whether it was selecting flooring, paint, fixtures, or a design of a room. His team was incredible, and we absolutely love the work they did! I highly recommend K6 Construction! You won't be disappointed in the quality of work or the quality of the people at K6 construction." "K6 Construction just finished a remodel of my house. Phil and his team did an amazing job... I really can't say enough! Phil was very easy to work with, organized, always professional, and very patient. They finished the job ahead of schedule and it turned out better than I could have hoped! I'd highly recommend Phil and K6 Construction for any remodel job!" "Phil and his team were wonderful to work with. K6 remodeled my master bathroom. It turned out beautiful and I couldn't be more pleased. Phil is a reliable professional who maintains the highest level of integrity in his work. I would highly recommend K6 construction for any remodeling job." "Phil and his team just knocked out a 6 foot opening in our family room to open it up, hid all of our tv wires in the walls, and installed two fans outside. Everything looks amazing and they were great to work with. Thank you!" "We have three Sport Clips locations in the Central Valley, with two in Fresno which we recently remodeled. We have used two different contractors on the three different jobs and are totally impressed with K6, and especially Phil's eye for detail and willingness to do extras just to help us out. When we built our Turlock location in April, we used another contractor who did a fantastic job. But, after acquiring two existing locations in Fresno and wanting to do a major remodel, we wanted to use someone local. After interviewing several contractors, including our original contractor from Turlock, we felt comfortable with K6 and Phil, so we went with them. Although our original contractor was good, Phil was unbelievable, mainly because his follow up and constant communication with us was extraordinary, and I've dealt with a lot of contractors. He remodeled our first location at Fort Washington in the exact timeline that he quoted, even though that required he had workers on sight throughout many of the nights (all night), and we were back in business just as we had told our clients. The second remodel of our Sport Clips location at Palm & Herndon in Fresno was finished one day ahead of schedule, mainly because Phil was able to overlap some of the workers and get it done in 6 days instead of the normal franchise remodel time of 7 days. The best part, besides his communication with my wife and I was the fit and finish. Most everything was perfect, our employees were amazed, and any issue that came up afterword, which were a few that simply couldn't be anticipated by either K6 or us, were fixed within hours. Highly, highly recommend these folks. Just call them, ask for a bid and watch the follow up. The follow up has always been the downfall of almost every contractor that I've ever used, and I was pleasantly surprised how good Phil was. For a real testimony, go by Sport Clips at Fort Washington & Friant or Herndon & Palm and see the work for yourself....and maybe get a haircut as well." "Reliable, affordable, easy to work with and willing to please. I highly recommend K6 construction, they have done a terrific job repairing damage to my home and did so in a timely manner. I will definitely call on them again, I couldn't be happier!" "So excited to have K6 construction doing our master bath remodel!! Got to go with Phil yesterday to pick out fixtures and tile, I felt like a kid in a candy store:):)... So thankful to have a contractor I trust to help us through this project!! K6 Construction... You're the best!!"